Ilyass Meslek, engineer at CCL, a specialist in engineered solutions for structures, discusses the design considerations for a road-over-rail replacement project in Blackpool where CCL was brought in to advise on the bridge bearing requirements during the early design stages. With its kiss-me-quick hats, world famous tower and seven-mile stretch of sandy beach, Blackpool is a town built on tourism. So when a road-over-rail bridge needed to be replaced to enable electrification of the railway line below, it was vital that the job was delivered during the tourist ‘off season’ to minimise the commercial impact on the holiday hotspot. Moreover, Blackpool’s holiday season is longer than most. Beginning with the Easter break, it continues right through to early November when the celebrated illuminations along the Golden Mile are switched off to make way for Christmas decorations. The bridge in question is on Plymouth Road. In addition to being on a major route into the town, it is in a residential area and above a busy rail line, which, aside from two weekend closures, had to remain operational throughout the programme. The reason for the bridge replacement was the electrification of the rail line as part of a programme of works across the North West of England, creating the need for a larger clearance between the railway line and the road above. Blackpool Council considered a number of strategies to minimise the impact of the works, including the possibility of jacking up the existing bridge or lowering the section of line; however, the close proximity of a station to the relevant section of line ruled out the lowering option and the poor condition of the bridge, due to its age and the corroded steel within the structure, meant that jacking it up was not a viable option either. The only feasible strategy was to develop a programme of works that would enable replacement of the structure, including raising of the soffit, within the five-month off season window with works taking place during overnight rail line possessions. 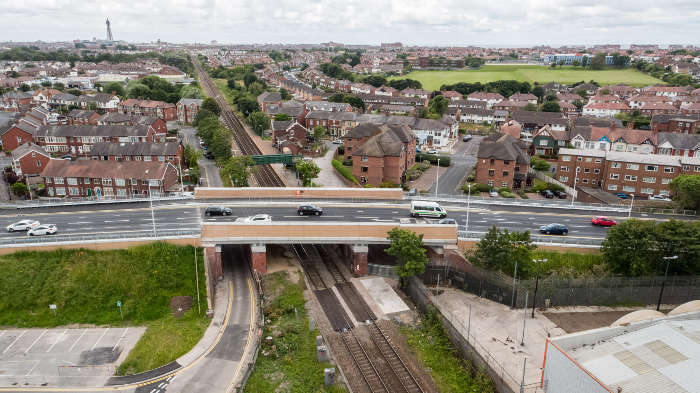 Designed by Wilde Consulting Engineers and delivered by Story Contracting for Network Rail, in association with Blackpool Council, the project required removal of the existing three-span deck, which equated to around 1,000 tonnes of concrete and steel. Because the road closure was limited to the tourist off season, Story Contracting worked closely with Blackpool Council to develop a programme that enabled diversion of services, including high voltage, low voltage, telecoms, fibre, gas, street lighting and a 750mm water main prior to demolition in a single phase operation. This was achieved by designing a new edge beam to the eastern side of the existing bridge which could be installed pre-demolition, creating an additional lane so that two lanes of traffic could be maintained during the service diversions. Once this was in place, the diversions were carried out as part of a three-month enabling phase. This solution provided a cost saving of £500,000 compared to the original plan for a two-stage diversion, as well as reducing programme risk. A temporary service bridge was also constructed during this enabling phase to maintain pedestrian access throughout the scheme, thereby avoiding any requirement for a level crossing and reducing any risk to public safety associated with the scheme. Due to the railway line below, the demolition works to the bridge could only be carried out at night when there were no train services and the line could be isolated. This gave the contractor an operational window of just six hours during the week and eight hours at weekends. Story Contracting used hydraulic bursting demolition techniques to minimise noise during the demolition phase, due to the close proximity of residential properties, and monitored noise throughout the programme. To ensure construction of the new bridge could be carried out over a minimal road closure period, the new bridge deck was constructed with 18 prestressed precast concrete beams per span, with 54 prestressed precast concrete beams in total for the three spans. The new bridge deck was constructed using the existing abutments and the concrete beams were lowered into position following installation of 108 custom-designed and manufactured elastomeric bridge bearings, using a 1,000-tonne lattice crane. With a combined weight of 600 tonnes, the precast beams were installed in day and night time operations over just two 54-hour weekend railway possessions. CCL was brought in to advise on the bridge bearing requirements of the project by Wilde Consulting during the early design stages of the project to ensure that the maximum vertical loading, transverse force and rotational movement could be achieved within the constraints of the bearing design. As a refurbishment project utilising the existing abutments and piers, the space available for the bearing shelf and, consequently, the bearings, was limited to the existing structural parameters. The existing structure also influenced the bridge design itself. Plymouth Road Bridge is a three-span bridge with the largest span in the centre, supported by a pair of central piers. If all three spans had been the same length, the replacement bridge could have been designed as a continuous structure. However, because the spans were different lengths, they were designed as semi-discrete structures to allow rotational movement at the piers. An infilled slab ties the three spans together while each span can act independently. Among the other key design criteria was the requirement for a high-containment parapet running the whole span of the bridge to safeguard pedestrians and mitigate the risk of any vehicles falling onto the railway line in the event of a road traffic accident. This parapet had to be factored into the design considerations for the bridge bearings because it increased the forces for the edge beams of the central span. The maximum force requirements for each element of the bridge were generated in structural analysis software and, for the majority of the 108 bridge bearings, the design requirements were for vertical forces of up to 750kN, transverse loading of up to 35kN and rotation of up to 0.006 radians. The precast bearing shelf was fabricated in three sections for ease of transport and CCL had to design the bearings to fit the dimensions of the shelf, which were restricted by the abutments and pillars. Speed of manufacture was also critical, as the bearings had to be installed within the prescribed window in the schedule, in line with agreed railway possessions. The CCL team developed a series of design iterations for the bearings so that the design and delivery team could agree the best-fit solution for the project. The bearings were then manufactured and delivered to site with guidance on the most appropriate fixing methodology. Once the bearing shelves were in position, surveyors marked out the locations for each bearing across the length of the shelf and each bearing was secured in place using an epoxy mortar. With all the bearings in place, the precast beams were lowered into position onto the bearings with a narrow void between each beam. All the beams were cast with transverse details to enable steel ties to be threaded through the new structure, tying the beams together. A concrete pour, totalling 800 tonnes of concrete poured in situ, filled the void between the beams to create a single, monolithic structure and a level deck 150mm above the surface of the beams. A bridge deck waterproofing surface was then sprayed onto to the concrete deck prior to installation of the road surface. Throughout the project, keeping the programme on track was business critical for both the contractor, Network Rail and Blackpool Council and the project was successfully completed three weeks ahead of schedule.